Allamanda sp. is an important ornamental plant for environmental and medicinal values. 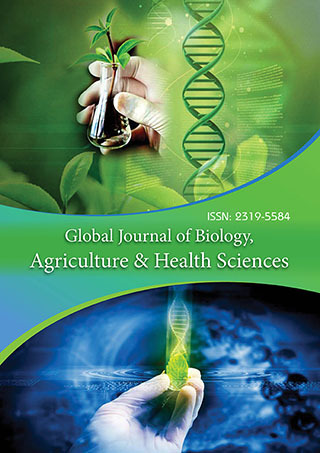 Plant growth hormone keeps a superlative role to improve the flower quality like early flower induction, color and size as well as hybrid innovative production in the floriculture industries. The study was carried out to evaluate the effects of gibberellic acid (GA3) at 100 mg/l and aluminium salt (sulfate) on the flowers development and early initiation. Number of buds and flower, flower weight, chlorophyll fluorescence yield and total carotenoid contents were determined. The result showed that GA3 at 100 mg/l application in bud initiated spot swabbing was most effective in getting early bud and flower initiation, delaying senescence and discoloration (fresh) followed by Al2(SO4)3 and water control. Chlorophyll fluorescence yield and carotenoid contents were also highest in flowers treated with GA3. The quantum yield (Fv/Fm) was maximal in GA3 treated flower. These results indicate that hormone application (GA3) was the best treatment to develop flower quality of Allmanda sp.